Haiti Artibonite Senator Carl Murat Cantave is the new President of Senate following elections held Thursday. 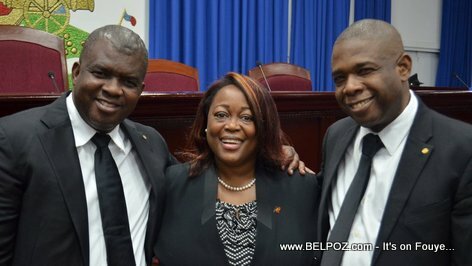 Cantave received 16 votes against his oponent Senator Pierre Francois Sildor who received only 12. Senator Cantave thanked all his fellow Senators for the vote of confidence they gave him that makes me the new Speaker of the Senate and the National Assembly for the 2019 legislative year. "I thank you from the bottom of my heart," President Senator Cantave said in a tweet. POU JAN CALMURAT CANTAVE AWOGAN NAN FÈ LWA SOU PRÉTÈKS LI SÉ ADVANTIS DU 7 TYÈM JOU? POU JAN ZOKIKI AWOGAN NAN FÈ LWA SOU PRÉTÈKS LI SÉ BATIS? KONMAN FÈ OUGAN YO AK MANBO YO FÈ PÈMÈT YO PRÉTÉ SÈMAN POU YO NAN MARYÉ MOUN, BATIZÉ MOUN, CHANTÉ ANTÈMAN? MWEN PA KWÈ NAN MASSIMADI SA YO MENM.